The Breakdown: Will the Financial Reform Bill Prevent Future Meltdowns? Obama signed the Frank-Dodd bill into law this week. What does the bill do to reform Wall Street, and will it prevent bailouts? Finance blogger Mike Konczal joins Chris Hayes to tackle these questions on this week's edition of The Breakdown. Nearly two years after a global financial crisis almost crippled our economy, President Obama this week signed into law the Dodd-Frank Wall Street Reform and Consumer Protection Act, otherwise known as the financial regulatory reform bill. The bill is supposed to prevent such a crisis and the subsequent bank bailouts from ever happening again, but will it really accomplish that? And more broadly, what does it do to reform the financial system that made Wall Street's abuses possible in the first place? 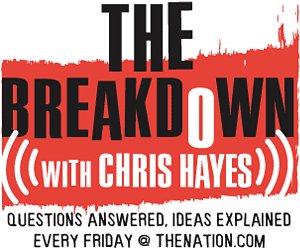 The Nation's Washington DC Editor Christopher Hayes and finance blogger Mike Konczal tackle these questions on this week's edition of The Breakdown. Nearly two years after a global financial crisis almost crippled our economy, President Obama this week signed into law the Dodd-Frank Wall Street Reform and Consumer Protection Act, otherwise known as the financial regulation bill. The bill is supposed to prevent such a crisis and the subsequent bank bailouts from ever happening again, but does it really accomplish that? And more broadly, what does it do to reform the financial system that made Wall Street’s abuses possible in the first place? The Nation‘s Washington DC Editor Christopher Hayes and financial blogger Mike Konczal tackle these questions on this week’s edition of The Breakdown. More information on our guest Mike Konczal. Konczal’s initial thoughts on the bill. An article by Christopher Hayes and Nomi Prins explaining the financial crisis.